Location: Near Talsarnau, Wales (O/S - SH 647354). Grid Reference: 52° 53' 52" N, 4° 0' 36 " W.
Bryn Cader Faner: (Cairn Circle). Bryn Cader Faner is one of the most beautiful Bronze Age sites in Wales. It is a small cairn 8,5m (28ft) wide and less than 1m (3ft) high, with fifteen thin slabs leaning out of the mass of the monument like a crown of thorns. 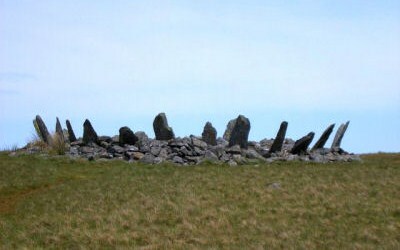 The combination of stone circle and mound at Bryn Cader Faner bears some resemblance to Carn Llechart, in Glamorgan (Wales), and it is probably the result of a fusion of traditions. The site was disturbed by 19th century treasure-seekers, who left a hole in the centre. Bryn Cader Faner: 'Crown of Thorns'. Description -Originally there may have been about 30 pillars, each some 2m (6ft) long. The monument sits on a hill overlooking the ancient Bronze Age track-way which starts at Llanbedr, a seaport for one of the main trade routes to Ireland, and proceeds to Wessex and the south of England via Trawsfynydd, Bala and the Tanat Valley. The most recent vandalism was at the hands of the army before the second world war, unbelievably they used the cairn as a target for gunnery practice and removed several of the stones. A similarly designed monument can be seen at Carn Liechart, also in Wales.